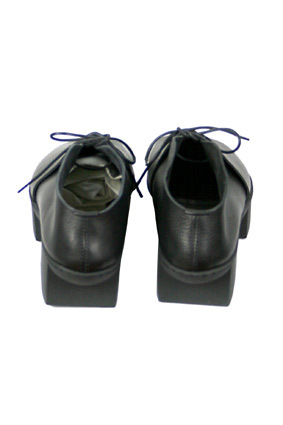 Trippen 'Deck' shoe in black textured leather (black-waw). High sole with gap between front section and heel. Lace up, single loop. The front upper section is not connected to the rear section, which goes underneath the front section. Beautiful shoes. Sizes 4=37 small, 5=38 medium, 6=39 large, 7=40 x-large.